Parsley is notorious for being hard to get growing. Many people sow packet after packet but with no success. 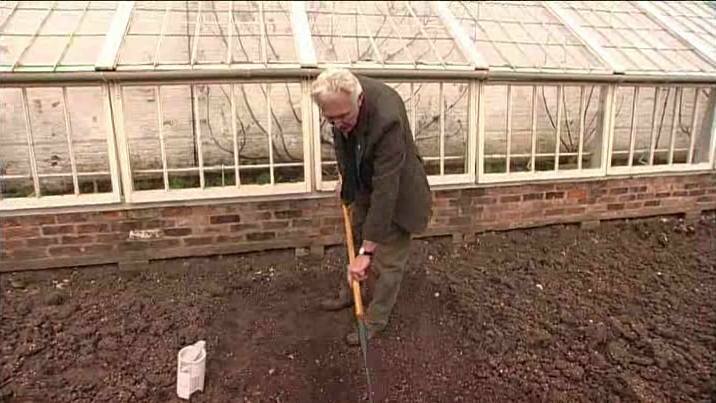 In this short video, Sam Youd, head gardener at Tatton Gardens shows us a fantastic simple tip to ensure germination. Despite the old saying, you don’t really need a pact with the Devil to get a good crop of parsley. Parsley is an easy plant to grow, once you get the seeds germinated and growing but that is the problem. I’ve heard all sorts of weird and wonderful methods to get parsley to germinate including soaking the seeds in urine, planting by the moon’s phase and leaving the seeds on the surface or sowing in pure sand. Sometimes these methods work and you can understand the reason behind it but master gardener Sam Youd uses a proven method to sow outside in a drill and still get good germination that is simple, cost-free and understandable. All he does is pour boiling water in the seed drill to sterilise the soil prior to sowing. This just goes to show that despite the march of science and modern methods, sometimes the simple old-fashioned ideas work best! Check out: Grow Your Own Parsley for more information about growing parsley and the different types etc.